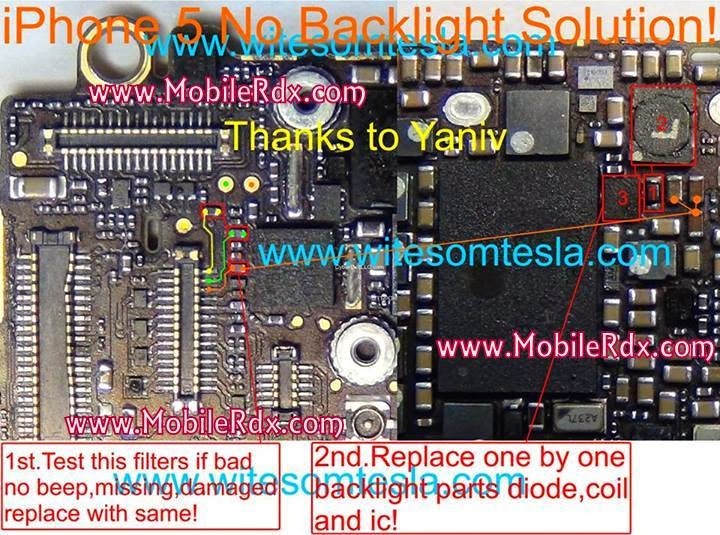 This Post Is For IPhone 5 Lcd Light No Backlight Problem Repair Solution.if Your Phone Display Light Not Work Try Below Solution. Please Not That We Will Edit This Solution If Found In This Page At Any Time In The Future. So Feel Free To Come Back Any Time On This Page To Stay Up To Date. After Disassambly Of IPhone 5 Look At The Motherboard For Rust Carbon Or Burren Parts. If You Found Some Rust Or Carbon Apply Electronics Cleaner On The Mother Board And Apply Hot Air To Make It Dry Proper.Do Not Aaply Much Heat It Can Damage The Motherboard Or Can Burn Componnent Simply Check Below Paths Tracks With Ur Electronic Meter If U Found Missing Track Make Jumpers. Note: Please Note That Even Though Every Solution Posted On Out Site Is Tested By One Or More Members Of Our Team Before Posting, But Still We Do Not Take Any Responsibility For Any Damage It May Cause To Your Cell Phones. Use These Repairing Solutions At Your Own Risk. Thank You.